42 Rules to Jump Start Your Professional Success (2nd Edition) | Buy Career, Leadership, Sales, Marketing, Personal Growth books. 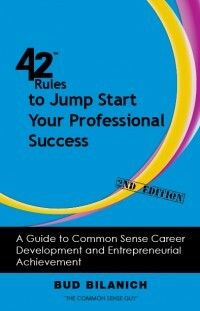 “42 Rules to Jump Start Your Professional Success (2nd Edition)” (also available in our career bundle) is a no-nonsense guide for creating professional success. Author Bud Bilanich, The Common Sense Guy, has been helping people succeed for over 30 years. He’s spent the last 10 years studying successful people, cracking the code to success. He shares what he’s learned in this book. In this career book you will learn how to take responsibility for your life and career, how to become more self confident, how to create positive personal impact, how to become an outstanding performer, how to become a dynamic communicator and how to become more interpersonally competent. In “42 Rules to Jump Start Your Professional Success (2nd Edition)”, Bud shares stories of personal and professional triumphs and failures and what he learned from them. He also tells other people’s stories that he finds inspiring. These stories bring Bud’s 42 rules alive. Written in Bud’s typical, straightforward, common sense manner, “42 Rules to Jump Start Your Professional Success (2nd Edition)” is a great read. More importantly, it provides the reader with practical, down to earth advice on how to create a successful life and career. Others have called Bud’s writing on personal and professional success “brilliant,” “authentic yet forceful,” “practical and actionable,” and “easily readable wisdom.” Get your own copy of “42 Rules to Jump Start Your Professional Success (2nd Edition)” and see for yourself.